Having battled our way up river against an increasingly stronger wind we heard on the VHF about the harbour being closed because of a race taking place. Boats ahead of us were advised to speak with coastguard officials who were maintaining security at the entrance and we heard a friend of ours call one of the boats ahead to advise that there may be a way through as the racing had been temporarily halted due to the high winds. We contacted them to advise of our imminent arrival and they kindly arranged some dock space for us should we arrive in time before the wind dropped and the racing re-commenced. Fortunately they held up the racing for an hour which gave us enough time to step up the speed and get through the spectator boats and secure alongside the town dock wall. Shortly after the racing restarted. 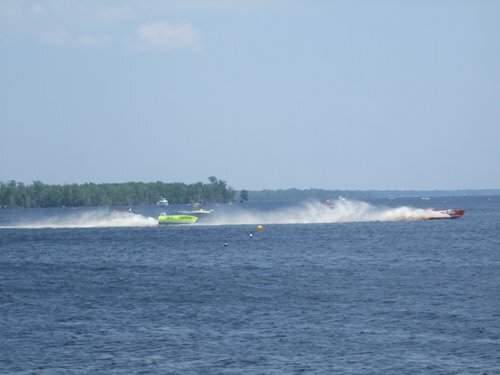 Tiny powerboats capable of 80 mph shot out of the pits and careered round a buoyed course at startling speeds especially on the corners. The noise was deafening. We were met by Sam Vanderslice (wonderful name!) the self-appointed harbourmaster who ran us through all the available services he could offer - propane top-up, diesel, gasoline etc. One small problem in the communication was that Sam is stone deaf so it was a real challenge holding any conversation with him but with a veteran's heart of gold he chaperones his visitors ensuring everything they needs is on hand, even driving us off to get propane and diesel in the back of his pick-up truck. We also went to the local Farm Fresh supermarket, being collected by the store's courtesy car and delivered back a few hours later with yet more shopping to stow onboard. 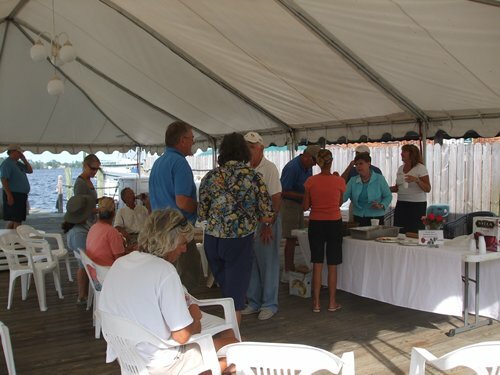 We attended a wine and cheese welcoming party hosted by the Rose Buddies of Elizabeth City. 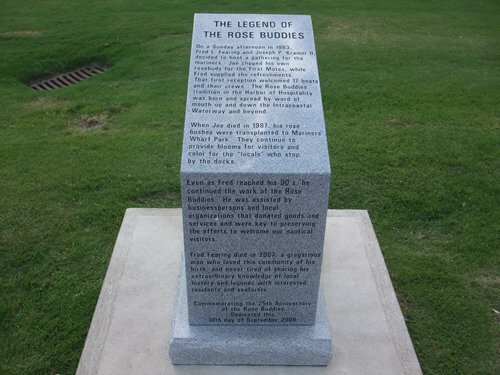 The story is told on a plaque sited in a rose garden on the dockside. 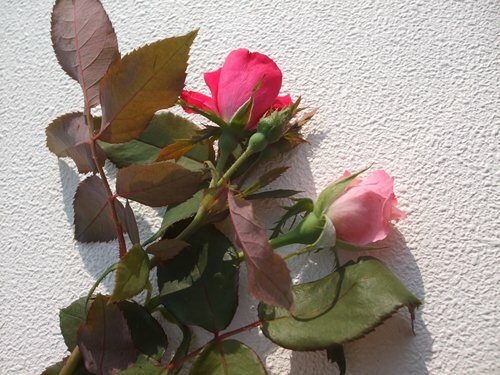 Two residents of Elizabeth City, Fred Fearing and Joe Kramer, hosted a cheese and wine welcoming party for visiting yachts in 1983, presenting the ladies with roses from one of their gardens. Despite the passing of both of these kind folk the tradition continues on and anytime five new visiting craft moor at the city dock (it's free for 48 hours) the cheese and wine celebration is hosted in a marquee close by. 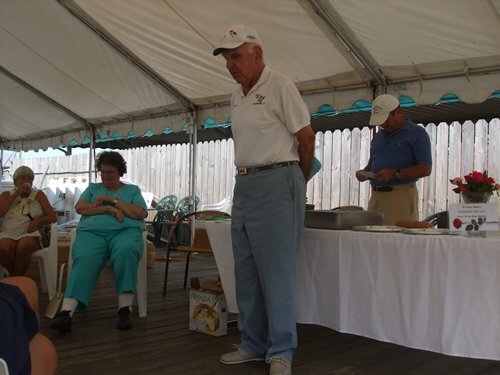 One of the current Rose Buddies attends to tell of the story of Fred and Joe and then to offers their experience of the surrounding waters and the passage through the Dismal Swamp Canal to Norfolk, a route we had not previously taken. David - a current Rose Buddy talking to the cruisers about the area Cheese and wine treats - not much left at the end as cruisers are like locusts! 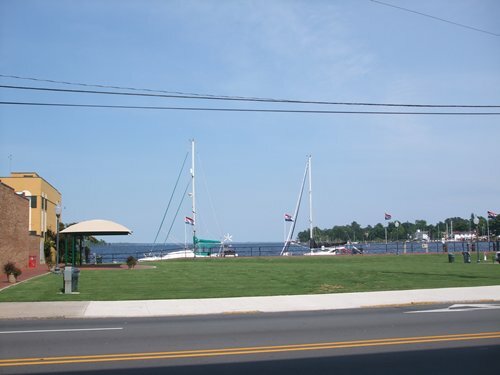 Elizabeth City has some great sightseeing away from the dock and we started with the museum which details how the entire area came to be developed all the way back to Indian and colonial times. This kept us amused for a couple of hours then we came across a real find in one of the older buildings down town. We were given a guided tour of an old vaudeville theatre which had been completely refurbished from local business and private donations. It's still used for dances and grand dining events as the seating in the lower section can be removed. Downstairs there is an art gallery with local artists exhibits. Just across the road Nikki spotted the perfect shop for those whose pates are becoming sparsely populated with hair! And across from there a department store dating back well into the last century displayed an interesting range of crimpleen and polyester suits with a wide range of patent leather spats and shoes for the natty dresser. 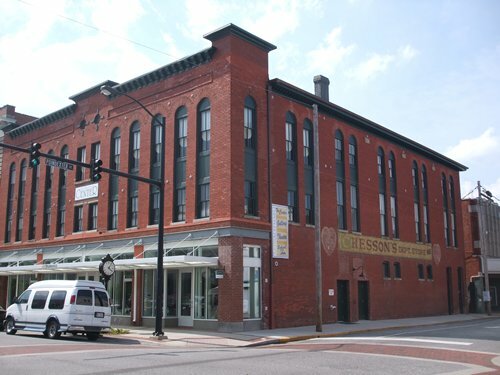 The restored Vaudeville theatre sits on the first and second floors. 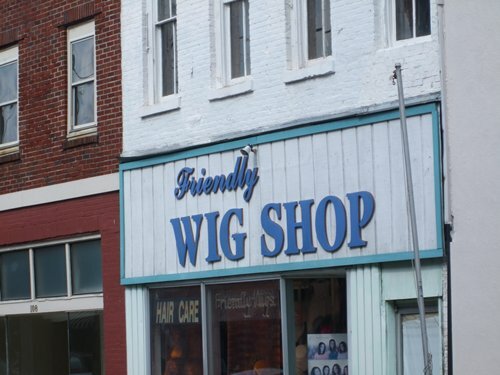 Good to know it's a 'friendly' wig shop! 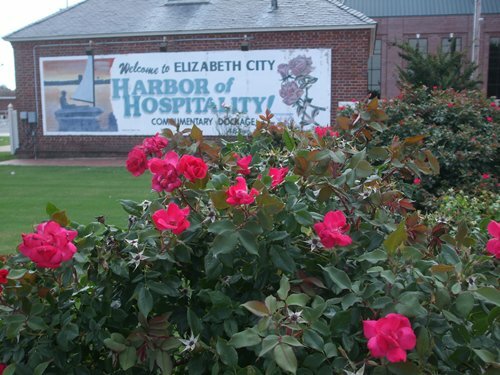 Elizabeth City proved to be a great stop - one of the friendliest places you could wish to be. The final evening we were treated to a showing of the Philadelphia Story staring Cary Grant, James Stuart and Kate Hepburn. This was in the open air on a temporary screen. About 200 people from town plus the yachties sat back and 'enjoyed' this classic comedy film from the archives. 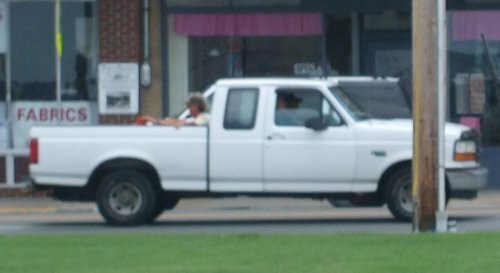 Nobody even left when the sound broke down for five minutes which was soon fixed. It was surreal looking across the park area at the screen and a little to the right sat Ajaya at the dock. It was time to move on and tackle the Dismal Swamp Canal or 'the ditch' as many cruisers refer to it as. This would lead directly to Norfolk with just the one stop somewhere along the way.